Manifesto progress: Gift giving, seeds sewn and old men playing duck, duck, goose. A couple of nights ago we offered free babysitting for parents who wanted a night out. The parents could go on a date, wrap presents, or finish up shopping. Whatever they wanted to do. 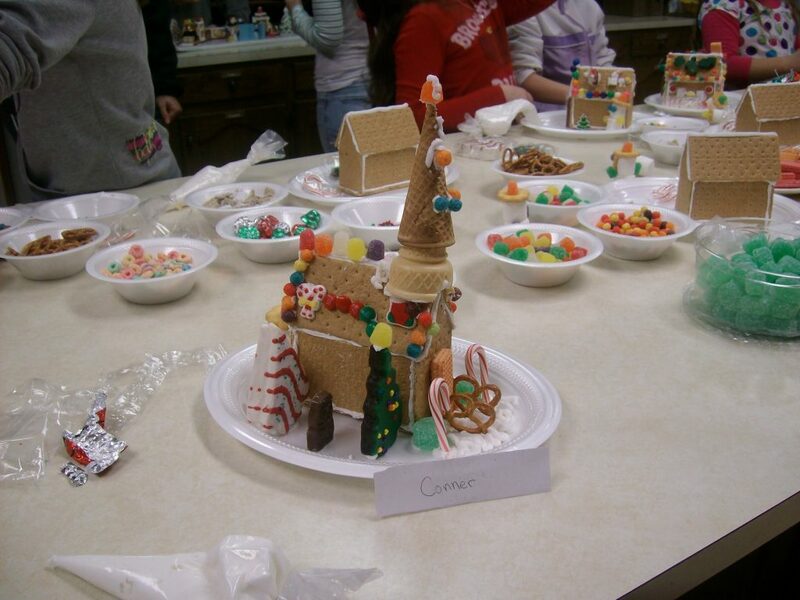 We made ginger bread houses with the kids, crafts, and read story books. My favorite was reading, A Tale of Three Trees. The older kids (mid-elementary) took turns reading the pages to the younger kids. In the spirit of my manifesto of approaching Christmas with a child-like spirit, I played duck, duck, goose with some of the kids. I don’t think I will ever forget one of the 8 year old’s comments, “It’s funny watching old men run around playing duck, duck, goose.” It was a joyful evening and a win/win for parents and children alike. I think I particularly love the fact that it was a very intergenerational evening. There was no television or electronics, just children and adults joyfully interacting. This past week we also opened our home to our congregation in several ways. Our church board members, called the Session, and their spouses came for dinner one evening, the Choir came the next night for a potluck, and the youth came on Sunday. I feel that many seeds of hope, love, and joy were sewn in our time together. There is something about eating together that is so very binding for a family of God’s people. Jesus chose a meal to be the foundation for one of the sacraments. He gave it to us to nurture us in our faith and draw us together as a body. Sitting at table with one another is a very good thing. Tonight I shopped for my family. I can’t say much about what I got just yet, but I can my gifts are very motivated by my manifesto intention to buy gifts that honor God and to make some hand-made gifts. Tonight I bought gifts for my children that will help them grow in their faith. I will be personalizing them and enhancing them I don’t want to say more than that just yet, but will share what I did after Christmas. Lastly, I have been very intentional about greeting as many strangers as I can with a wish for a Merry Christmas. Many seem to appreciate it. Also, I have continued to read and journal daily on stories about Jesus. A daily dose of Jesus, not just scripture, but specifically reflection upon Jesus has been wonderful and I am seriously considering making this a regular part of my devotional diet once Christmas has passed. I know none of these actions are very earth-shattering. Nevertheless, cumulatively they have made my experience of Advent more full of love, peace, hope and joy. When all is said and done, I think this will have been an Advent where I have experienced and hopefully offered many touches of grace. This Advent has been more Jesus full. What more could I ask for? Advent blessings to you. For those of you who haven’t read my Christmas Manifesto, click here. Sounds wonderful! I think I will try to get my church to do something similar next year with the babysitting. Also, one year my family did homemade gifts, and it was wonderful. After reading your manifesto I gave some serious thought to this. A few months ago my mother in law gave me her mother’s old recipe box. Yesterday I made her mother’s recipe for divinity candy to give to Stephen’s family for Christmas. I’d never made it before, and by a miracle it turned out beautifully! Anyway, not sure if this is honoring God, but I am trying to honor my in laws and hope it brings back some nice memories for them. Elena, if you don’t want to wait until next year on baby sitting, your church may consider offering free baby sitting for a date night on or around Valentine’s Day. We will be doing that and will probably make some small craft or Valentine for the children to give to their parents. With regards to gift giving, kudos from The Practical Disciple to you for being very intentional and giving meaningful gifts. When writing my manifesto I struggled with the gift giving items. I wanted a focus to make sure I wasn’t just mindlessly caught up in the commercialism of Christmas. Giving Godly gifts and hand-made gifts were two specifics that could give me direction. I also considered giving “green gifts”, meaning, gifts that were recycled, minimally packaged, or environmental beneficial. Perhaps, that will be my goal next year. I love that your divinity recipe gift strengthens your family bond by drawing on a tradition unique to your family. It’s hard for me to imagine that your family is not going to feel the love of that. Thank you for sharing. happy. I love your blogging. What thoughtful gifts. I am sure they were appreciated. Thank you for your comment and praise of the Practical Disciple. I am blessed to get to do it. I look forward to expanding how I serve you, the readers, this new year. Merry Christmas and Happy New Year.